If left untreated, pet urine can become a severe problem and may require you to replace your carpet completely. Stay on top of regular appointments for Van’s Chem-Dry’s Pet Urine Removal Treatment (P.U.R.T.®), and your most severe urine soaked carpeted areas can be saved. P.U.R.T.® is a revolutionary process that is specially formulated for pet odor removal and to eliminate urine odors forever. Instead of simply masking the odor, our product has demonstrated success on even the most potent urine stains by completely removing them from the carpet and eliminating the odor. Pets will often urinate continually in the same spot without you even realizing it. 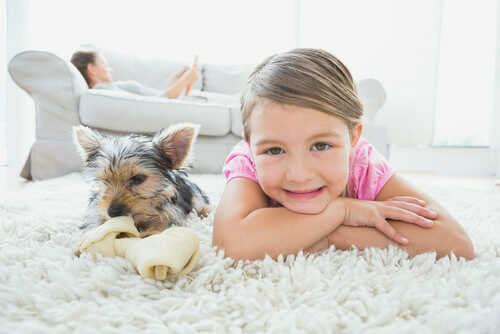 When pet urine fills your carpet, it also seeps into the backing under the carpets and to the flooring below. Urine odors can permeate from the ﬂoor, be it cement or wood, from the tack strip, and even from the framework of the house behind the walls. As pet urine dries, the liquid evaporates but the urine crystals become even more concentrated and pungent. Simple cleaning will not remove this odor. The sooner you call Van’s Chem-Dry, the better chance we have at fully removing urine stains before they damage your carpet fibers. Call us now to see the wonderful treatments we have to remove urine stains in your carpets! The source and severity of the odor are determined, then the carpet is rinsed with hot water to remove the bulk of the urine crystals. Over the next 24 to 36 hours, the ingredients in P.U.R.T.® will react with the urine, and break down the odor-causing components.